Urban Composter turns scraps into nutrient-rich fertiliser – on your kitchen bench! 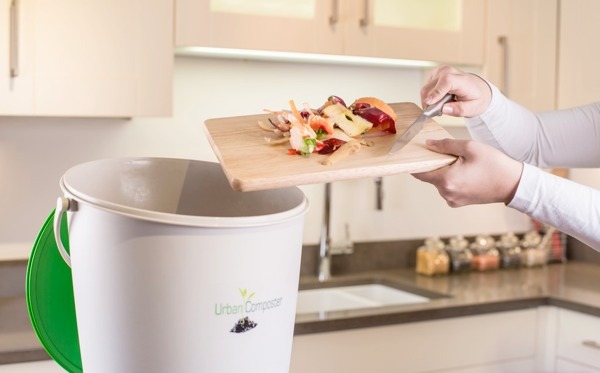 Urban Composter transforms kitchen scraps into compost without smells, flies or rodents. Our system is transforming the way large and small families manage their kitchen scraps in an eco-friendly way. You throw scraps into the bucket and spray them with Compost Accelerator. The citrus-scented spray contains the Effective Microbes (EM1) that break down your left over food. So now your Kitchen peelings, egg-shells and other organic waste can all go into the bucket and you don’t have to leave the kitchen to compost. There are now two sizes of bucket one for large families and the other for smaller apartment living. The Urban Composter Bucket is designed to replace traditional kitchen scrap containers for larger families. You get all the benefits of bokashi without leaving the kitchen. They are a stylish composting system that you’d be proud to show-off in your kitchen, with no mess or odour. The new Urban Composter City™ bucket has been completely redesigned with apartment living in mind. Some families don’t need the large capacity of the 15 Litre Urban Composter Bucket, so the smaller bucket provides the same composting in a handy 6 Litre size. Small enough for confined kitchens and under the kitchen counter. Urban Composter is bokashi done better – with messy bokashi bran replaced with a simple and effective spray. It’s simple to use. Cut your scraps into small pieces are placed into the Urban Composter. All types of food scraps can be composted including: Meat, Fish, Vegies, Fruit, Dairy, Coffee, Wilted Flowers (no bones or excessive liquids). Compost Accelerator is sprayed on the scraps and this starts the fermentation in the bucket. The system uses an anaerobic composting process which means that the food scraps don’t rot or smell while breaking down. You will notice compost tea is created as your kitchen scraps ferment. This compost tea is saturated in good bacteria and nutrients and you should drain it from the bucket every few days. This is nutrient-rich food for gardens and pot plants, or you can flush it down the drains to promote a good septic system. The scraps break down in 4-8 weeks. Once the bucket is full, and all the liquid drained, the pulp can be buried in the garden, in a pot or planter of soil, added to outdoor composting or to worm farms. Like any composting process it can take some trial-and-error but help is always available on our Urban Composter Facebook page. The Urban Composter is simple to use, even for someone who had never composted organic materials before. I thought it would be more smelly than it was. The composting spray seems to take care of a lot of the odour. It’s a citrus smell so it’s not unpleasant on the nose. The other thing is that it’s a closed composting bucket, without oxygen and this anaerobic process is less about ‘rotting’ and more about ‘fermenting’, so the smell is going to be more sweet than sour. This is a very neat and practical product, looking forward to making liquid plant feed and compost for our new veg garden. Where can I buy the Urban Composter?